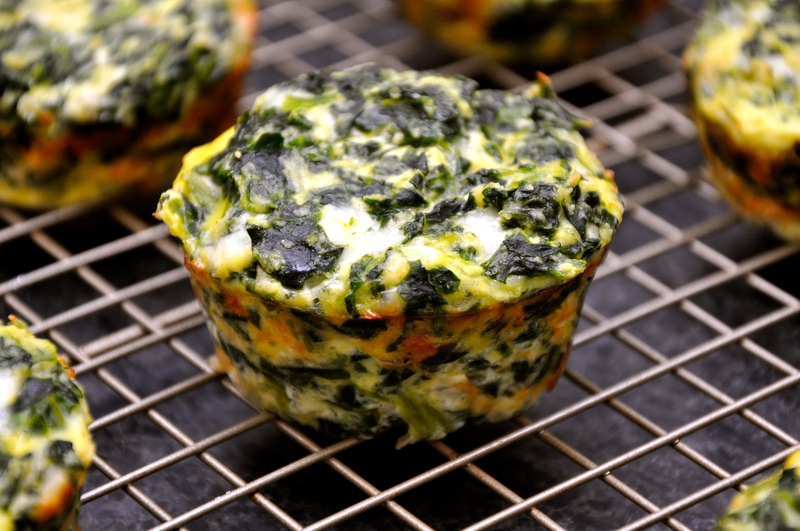 These spinach ricotta frittata muffins are the most go-to of my muffin repertoire. Muffinizing frittata is effortless and involves minimal steps. Each of these is a no-mess meal that requires not a single fork. Serving them for company is impressive, and they fit perfectly into school lunch boxes. Dense with protein from the ricotta/spinach duet, these muffins are dainty but strong and full of flavor. Although they do not contain butter, their golden edges seem to hint of butter. They are delicious, right out of the oven, at room temperature, and even cold. These muffins bring memories of Sunday brunch, but also work well for breakfast, lunch, snacks, and dinner. 1. Heat oven to 350 degrees. Grease muffin pan with cooking spray or line with paper liners. 3. In a large mixing bowl, whisk eggs and stir in ricotta, mozzarella, and Parmesan cheeses. 4. Stir in spinach, salt, onion powder, and garlic powder. 5. Use an ice cream scoop to spoon mixture into muffin cups. 6. Bake for 20 to 25 minutes or until muffins are set and golden on top.